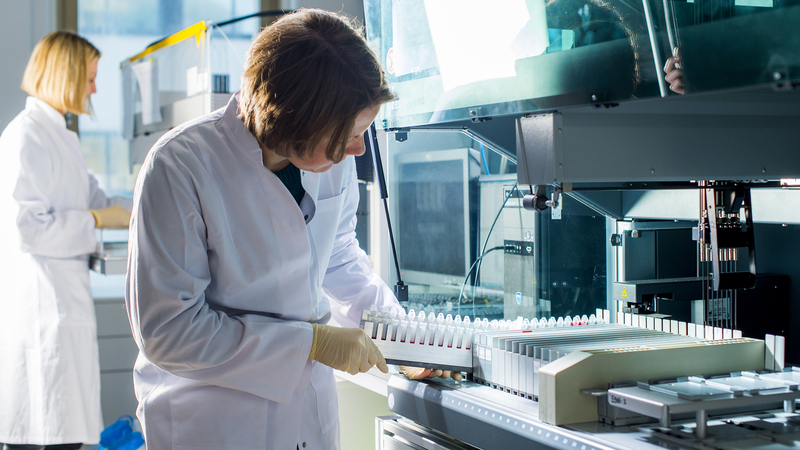 The IKMB DNA platform is a state-of-the-art laboratory that prepares DNA samples for high-throughput analyses (genotyping or sequencing) using lab robotics (e.g. Tecan Freedom Eco®, Agilent™, Bravo™, Fragment Analyzer™). The high degree of automation ensures maximum accuracy, reproducible results and high quality. The platform is the primary entry site for new samples that arrive at the Institute. About 50 blood samples from new patients arrive every week for further processing. Using robotics DNA from more than 300 blood samples can be prepared in one week by the Autopure LS® or Qiacube system. Both machines are able to isolate DNA from both liquid blood (200 µl up to 10 ml) and “buffycoats” (leukocyte concentrate of blood after gradient centrifugation). The IKMB samples as well as samples from the PopGen biobank are processed and stored in the central sample repository. To this end, the storage contains 4× 4°C fridges, 16× -20°C and 17× -80°C freezers. Our automated samples storages have a capacity of 1 million tubes for -20°C and 1.1 million tubes for -80°C. The lab also contains 3× walk-in sample storages: -20°C for DNA working samples (with a capacity of 10 freezers) and a -80°C storage for up to 1 million blood/serum samples. Our sample repository currently contains more than 100.000 DNA samples and a similar amount of blood samples. The IKMB closely collaborates with the PopGen  biobank and mutually shares resources (staff, equipment). We comply with the PopGen and P2N  standards for managing, processing and storing biomaterials. Our lab welcomes external collaboration partners and provides the necessary infrastructure to exchange samples and associated data. If you have any questions or if you are interested in such a cooperation please contact Sandra May . The meeting is open for collaborators who want to discuss or prioritize their ongoing projects at the IKMB. For registering a new project please contact the respective platform leader.